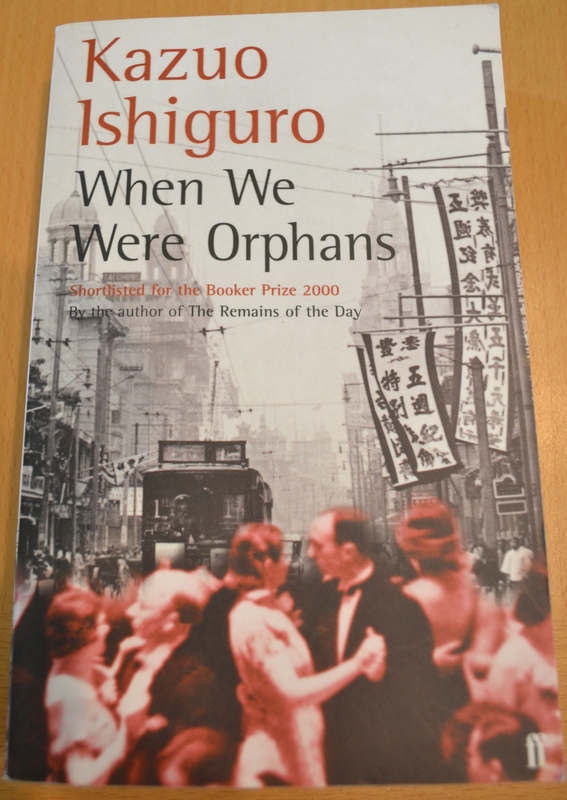 I’ve read The Remains of the Day and Never Let Me Go by Kazuo Ishiguro and enjoyed both, so when I spotted When We Were Orphans on a shelf at a local charity shop (you can see what else I picked up here) I looked forward to reading another of Ishiguro’s novels. When We Were Orphans follows a celebrated detective in London, Christopher Banks, in the 1930s. Despite his success, he is haunted by the disappearance of his parents when he was a young boy in Shanghai – a case which has remained unsolved. The novel charts his search for his parents, but also explores memory and the need to return. One of the central ideas Ishiguro explores in this novel is memory, and it is the truthful depiction of this which is one of the qualities of the book. The majority of the novel sees Christopher recounting memories, and the prose moves fluidly and smoothly between them. What I felt worked well was that the act of remembering was depicted truthfully. Like memory, the novel – particularly in the beginning – was meandering, with one memory following another, sometimes taking us down false leads, and taking us along trails of memories that led us to the present moment. Another aspect which worked well was how Christopher regularly questions whether his memories are accurate. I’m not usually a fan of flashback scenes in novels – who really remembers a conversation that happened 20 years ago word for word? – but what Ishiguro does with this novel is make Christopher acknowledge the fallibility of his memory. Christopher might not remember all details, events can be distorted and impressions can be false. This makes you doubt if everything you’ve read, and everything you will come to read, is completely true, but I was so completely drawn into Christopher’s memories that it felt as if I was deciphering his memories for the truth along with him. One problem with having events recounted to us by Christopher is the distance this places between the action and the reader. Ishiguro’s writing style and narrative voice exacerbate this. I found that the polite and formal narrative style (which reminded me of Stevens’ in The Remains of the Day) serves to make us merely observers rather than “participators” in his search for his parents. This works well in the first sections of the novel which are primarily about him growing up, but in the latter half when he visits war-torn Shanghai to further his investigations, the tone doesn’t quite match the severity and danger of the situation. Although I could see the need for Christopher to find his parents, his unwavering and consuming desire to find them isn’t reflected in the language. Placing Christopher’s search for his parents in the setting of war both showed how important finding his parents is, but also made me sometimes feel exasperated with him. He became so focussed on his goal that the latter part of the novel slipped into the absurd at times, which contrasted starkly with the realist style seen at the start. Although the novel is about Christopher’s search for his parents, the majority of the novel is more about his childhood and growing up, and it is these parts I enjoyed most. In the end, these memories, his past, and his experiences help us to understand how important finding his parents is to him and how his entire life has been leading up to finding them. Yet, although the novel is about him growing up, Christopher sometimes comes across as naïve, and with a startling clarity, the reader sees things for how they really are, rather than how he sees them, adding to his acknowledged unreliability. I thought this contrast between his “growing up” and his adult naivety was an interesting idea set out in the book. The ending of the novel is a satisfying one, encapsulating the sentiments of the novel. Ishiguro’s graceful prose explores memory and the desire to return to the past, both of which are the highlights of the novel. I’ve read and enjoyed The Remains of the Day and Never Let Me Go and I think When We Were Orphans would be up my alley, too. Ishiguro’s “explotartion of memory” sounds like a delightful journey. Thanks for the great review! Thanks for reading and commenting! I hope you like the book, let me know what you think of it.